DUN DUN DUNNN… dramatic. 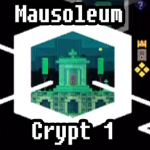 The Mausoleum Area is so-named because it’s, y’know, cryptic. Ahem. 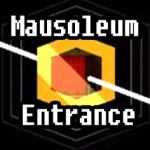 Moving on, let’s observe even just the entrance to this place! The trick here is to go through the door. No matter what you’ll either go one way or the other, never back to where you entered from. There’s a couple bits in here, just grab them and head on through the door. 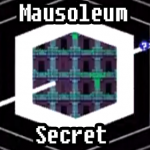 The Mausoleum lies beyond it! Ah yes, another beautiful hub world. We’ll switch to hub world mode to help you find stuff! Here’s a map of the doors and where they lead to. The first door you can get to is the easiest, so go ahead and check that place out. There’s a very good chance you have no idea what’s going on here, but it’s actually pretty straightforward. If you want to figure it out on your own, you’re welcome to, but really it’s one of those things that comes together as you play the game. Still, just in case, we’ll send this area to the SPOILER ZONE. 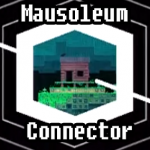 Pick up the bits in this area then head back to the Mausoleum. Moving throughout the area has a bit of a gimmick to it. When the lightning strikes you can clearly see blocks floating in the area. Use those to get around. If you’re too lazy to wait for the lightning, just look for the rain bouncing off the blocks. 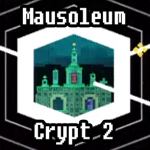 There are a few ways to go from here, but we’re going to go ahead and start with Crypt 1, as seen on the door-map above. Let’s go check that place out. This place is all kinds of full of bits! Let’s pick those up, then get down to the good stuff. There’s a door here off to the side that we can just walk through to continue our progress, let’s do that later though. Treasure Map – First, climb to the top of the area to get the chest so very far above your head. Open that to get another piece of treasure map-y goodness. From there, go through the door that shares a platform with the chest. In that room are a couple bits and another ghost to talk to. Get your chat-with-a-ghost quota filled then head back to Crypt 1. If you have a key, go ahead and open the locked door and go through there. Because locked doors are awesome. This area is another fun puzzle. You’ll note that there are four sides to this place, each with different opened and closed doors. When you enter them, you’ll come out of entirely random other doors. You should be able to draw some connections by now between this area and the four treasure maps you’ve got that look like it. 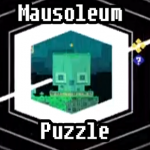 Technically, the key to solving this puzzle will be discovered later, so the full solution to this puzzle will be in the SPOILER ZONE. 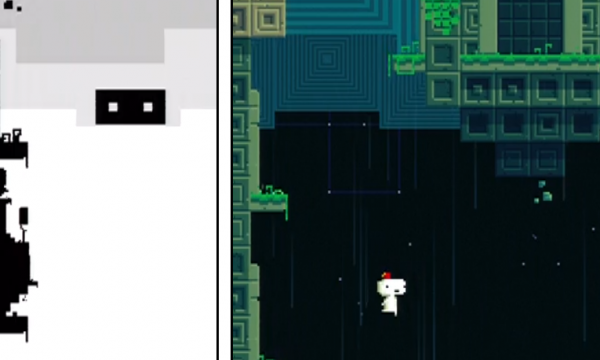 However, do feel free to take a stab at it, solving it might provide some insight on other, larger riddles Fez has to offer. If you solve this, awesome, if not, return to Crypt 2 either way. Gosh, there are doors everywhere aren’t there? 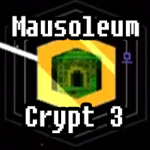 Check out this door mid-way through Crypt 2 to get to Crypt 3. Cube – There’s even MORE bits in here! Not only that, however there’s an actual cube! Let’s get that. It’s easy. Just… climb the tower. Then go back to the Mausoleum or just return to Crypt 2. We recommend the latter. Upon returning to Crypt 2, you’ll encounter a bomb puzzle. After that, make your way to the top and claim the bit hoisted so high up there. Once you’re done with that, drop down and proceed through the wooden door there. Head through there and into the room with the easiest cube ever. 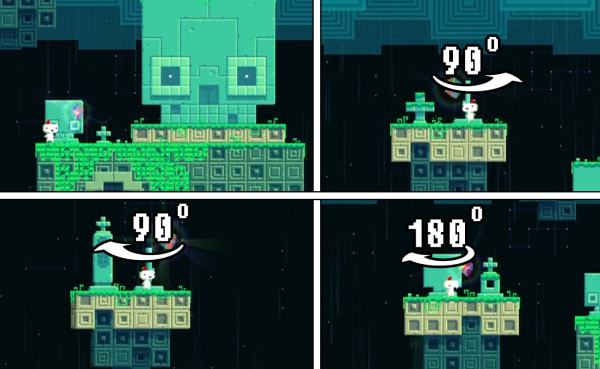 Cube – Jump up the platforms and grab it! Super tough puzzle. Also in that room is a ghost here… for some reason. Really not sure what that’s all about. But it’s a ghost! Neat. After you get the cube, there’s a warp gate which you might as well take back to the Mausoleum. 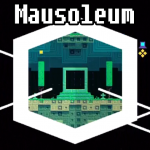 Back at the Mausoleum, head up to the top for the final door to check out. This one has a fun puzzle in it! There are some bits to collect, bit by bit, so collect those for a bit. Then, let’s get down to the puzzle! 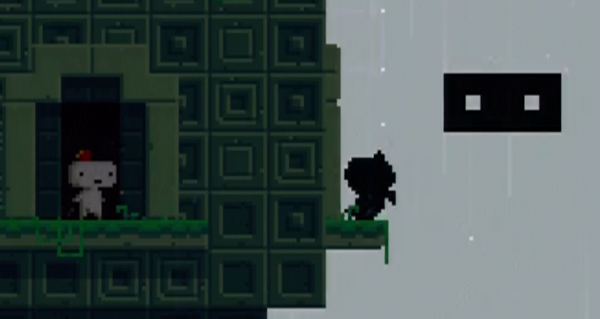 Anti-Cube – There are tombstones scattered about this area with one big one creepily staring into nothingness. Each tombstone can be rotated. Simply take each tombstone and rotate it until it faces the same direction as the big one. Since the big one follows you around (creepy), just make them all face the same direction. When the skull head stops moving, you’ll be able to get to the door behind it. Head through it to get an anti-cube. Hit up the warp gate and head back to the Mausoleum. Other than the secrets, you’re done here. Either solve them now, or come back later. Here’s some options for you now. Do you remember that room where the guy who wore the Fez before you was staying? Well it doesn’t matter if you do because we did for you. In his room, on each wall, is a picture of an owl on a tree. Not in a tree because Fez doesn’t have such things as “insides” of trees. 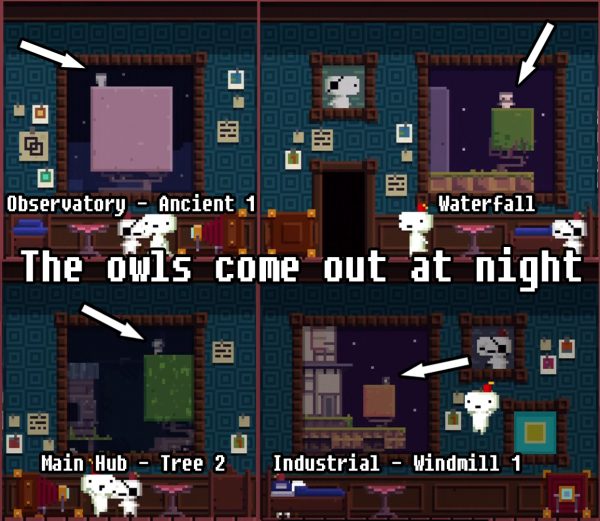 Each picture shows where an owl will be. They only come out at night, but the key to knowing where an owl is (beyond reading the guide) follows that any area (with a tree) where you have a secret sign despite having completed everything will likely have an owl. Not only does solving this puzzle grant you what is likely your final missing bit, it also grants you an anti-cube. So. That’s cool, right? Should be. Next up is the place with all the millions of doors. The solution to this puzzle assumes you’ve solved the Numeric Cipher. If not, we won’t explain beyond what’s necessary to solve this puzzle. Each treasure map is numbered 1 – 4. Simply enter the door marked on each map on the correct side in the correct order to be taken to a room with the Skull Artifact in it. Remember, you have to enter each door in the correct order. The fact that you’re sent to a random room doesn’t matter, on the fourth door you’ll enter the correct room if you did it right. Like the other ones, it doesn’t do anything, but it does look pretty cool. Not only that, but you have to swim for it. Jump into the water and swim for it. Rotate around to see where the chest is, but keep in mind it’s a long swim.